Farming with environmental care, whilst ensuring a profitable farming business is what LEAF and its IFM principles are all about. As a farmer, I need practical management tools to help me to do this, that don’t cost a fortune, aren’t going to take up all my time, are easy to use and work! LEAF membership has definitely made me more aware of the environmental impact of our farming practices. For example, because we farm along the Waveney Valley, soil erosion is a particular issue for us. Prompted by questions in the LEAF Audit, we have put tramlines across the field and leave some areas fully cropped to prevent gulleys forming. 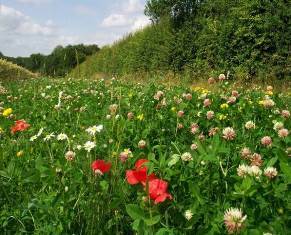 We were also one of the earliest entrants into ELS and focused on targeting ELS options, such as wildflower areas and field corners, to the least productive areas of the farm. I really think being a member of LEAF and doing the Audit gives us a head start on new environmental regulations. It makes you question everything and has developed my whole attitude to the environment.